Bedford have named their team to take on Plymouth Albion in their pre-season friendly at Goldington Road this afternoon. The game, which kicks off at 3pm, will be director of rugby Mike Rayer’s first real opportunity to cast his eye over his squad in a competitive match following two months training. Speaking to the official website, he said: “It’s been a long summer and there have been a lot of changes around the squad and in the coaching set-up, but I’m confident that we have a great group of lads who are looking forward to getting stuck into the Championship this season. 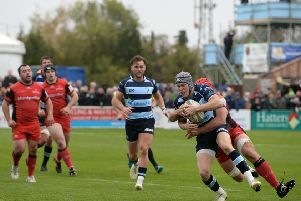 “There have been quite a few changes in playing personnel this summer, but I’ve been so impressed with the way in which the new recruits have settled into life at Goldington Road. “There is a great harmony around the club and I’m looking forward to seeing this transfer onto the pitch. “We have a tough challenge ahead of us this weekend as Plymouth finished last season in fine form and will be looking to push on once again. Kieran Hallett put together an excellent squad, and in my opinion, they are a Championship side in waiting. “We certainly can’t take anything for granted and it’ll be good to see how the lads cope with such a huge task. “It is also a great opportunity for me and the coaches to see all the players in action and see how they interact with one another. Bedford will make use of 29 players during this weekend’s fixture with new signings Chris Czekaj, Rich Lane, Will Hooley, Lee Dickson, Sean McCarthy, Tom Lindsay, Alex Penny and Jarad Williams all set to start for their Goldington Road debut while Alex Rae makes his return to the Blues. Replacements: George Edgson, Jacob Fields, Camilo Parilli-Ocampo, Ralph Adams-Hales, Dave Spelman, Paul Tupai, Justin Blanchet, Josh Buggea, James Lennon, Harry Sheppard, Dean Adamson, Matt Riddington, Ollie Dodge, Elliot Clements-Hill.